State-owned transport group Transnet officially launched its international subsidiary Transnet International Holdings on May 30. Constituted as a separate legal entity, with its own Board of Directors, TIH is intended to leverage Transnet’s core skills in the operation of ports, railways and pipelines, as well as promoting intra-African trade and increasing connectivity. It will be responsible for Transnet operations and projects outside South Africa, both on the African continent and further afield. TIH has been established as part of Transnet’s international strategy, which was developed in line with the Department of Public Enterprises’ Africa Strategy principles and approved by the Transnet Board of Directors in May 2015. "These are exciting times for Transnet," said CEO Siyabonga Gama at the launch of the new subsidiary. "I am confident we will succeed in linking African economies, connecting people and growing our continent." Transnet is expected to sign a formal agreement within the next three months to support the rehabilitation of Ghana Railways under a strategic partnership between the two countries; a delegation from Ghana including Minister for Railway Development Joe Ghartey and GRC acting Managing Director John Essel visited South Africa for discussions on May 28. As an interim step, ahead of the signing of the permanent agreement, Transnet has agreed to lease six locomotives and 110 wagons to GRC ‘on favourable terms.’ It will also provide 24 passenger coaches for use on the Takoradi–Tarkwa and Accra–Nsawam lines. 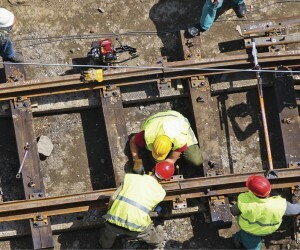 A technical team from Transnet is due to visit Ghana in June to assess the condition of the track on the Western Line. The company is to act as technical advisor for the rehabilitation of the Accra–Nsawam and Accra–Tema suburban routes, and will study the feasibility of extending services to Koforidua. It will also providing technical assistance for the revitalisation of freight services on the Western Line from Tarkwa to Awaso and Dunkwa to Kumasi. Up to 20 GRC staff are to undergo safety training at the Transnet School of Rail, with six senior officials to undertake post-graduate courses in railway engineering. The Fourth Industrial Revolution... is the defining zeitgeist of our nascent century. It promises a fusion of technologies poised to disrupt almost all industries and transform systems of production, management and governance. What does this mean for Transnet going forward? Although we've placed great value on our infrastructure expansion and logistics activities, we now need to acknowledge the exciting prospects sprawled before us in the fast-emerging digital opportunities of the Fourth Industrial Revolution. As Transnet, we require resilience, agility and rapid adaptation to transition successfully over the coming decades. On a continent still widely beset by social inequalities, food insecurity and persistent job losses, a transition to a futuristic digital world seems remote. This, however, will be exactly the fertile soil from which emerging technologies, entrepreneurial ideas and digital innovations will grow and thrive, leapfrogging the growing pains experienced by developed economies. Transnet has a critical role to play in furthering South Africa's strategic and economic objectives and is actively refreshing its brand as it moves into new markets, expands and diversifies its service offering, and redefines its market position. As such, we are experimenting with blockchain technology in our transacting, utilising drones in our rail business, exploiting 3D printing in our R&D and developing smart applications to manage access in our ports.